Well hello to you my reader chums! With the announcement of Zoella's second book, I was intrigued to get my hands on it. I ordered in advance and managed to buy one of the limited signed editions. As I enjoyed the plot line of the first book, I was rather excited to see what the next story would entail and how everything unfolds. Narrative - Following on from the first novel, the story was solely told from Penny's perspective in 1st person and through blog posts as her 'girl online' alter ego. I loved this aspect of the book as 1st person view points are my favourite because it's more personal and you're able to connect with that character straight away. Also the blog posts segment is a layout I've never really seen before, adding a unique element to the tale. Plot - Compared to the first book, I preferred this story line. 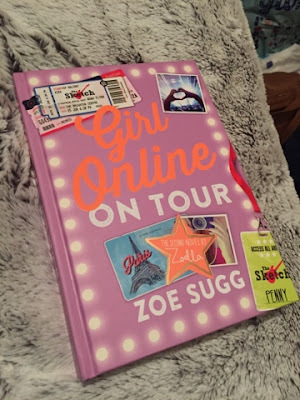 Personally I think 'Girl Online' was an introduction to Penny, her life and first love, whereas this book took it to the next level, heading out on new adventures and bringing in additional characters. As Penny embarked on Noah's first tour, a series of locations were described, opening your eyes to some beautiful destinations. Despite things not turning out how she planned, several exciting and shocking, unexpected occurrences happened within the book. Written as a general teenage love fantasy, the cutesy, mushy parts or scenes were crafted exceptionally, creating very touching and heart warming moments, every reader is guaranteed to adore. I really love the journey you're taken on in this book, where this highs, lows and truly loving moments appear, where you can't help but beam. It's rather nice how you see the protagonist, Penny grow from one book to the next where she is able to cope with things including her anxiety and being away from home. As I said about the first novel, I'm happy anxiety is talked about and made aware throughout, opening the readers eyes. 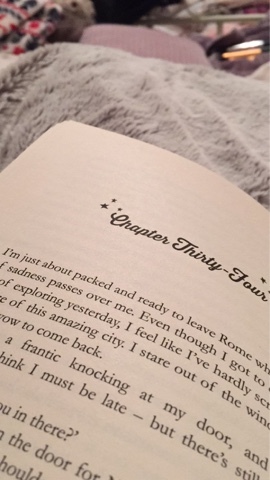 An aspect I noticed in both books was how modernised they were written with apps such as Whatsapp or Snapchat mentioned. As much as it was relatable to of had these included in the book, I felt it was a bit too 21st century if you get me? I guess for the younger audience it's aimed at, it's what they've used through their young teenage years but I wasn't as obsessed with social networking till much later and therefore that was the only feature I wasn't keen on. Saying this overall I thoroughly loved the plot, reading over half of it in one sitting. I think the way she held the words with deep descriptions, grabbed your attention, enticing you to continue and find out what's next. Characters - One of my favourite features of the book was the addition of new characters and the growth of older characters in the previous tale. My top one has to still be Elliot or Wiki as he's known on the blog. He just seems like the perfect best guy friend every girl needs in their life, full of fun, motivation and positivity. You get to learn about Noah's band members, more in depth of Penny's other friends and little surprise additions, bringing in fresh faces. There's unexpected friendships and relationships which turn out not to be that trustworthy at all but as a whole the admiration of the heart warming characters continues. You learn which ones in Penny's life are the goodies, baddies and keepers which I love. Ending - From the beginning of the novel, I had an idea of what I thought the ending may be ( I'm obviously not going to give it away) and to some extent that did occur. I wasn't expecting all the ins and outs that happened throughout to get to that point, but nevertheless it landed on a a slight cliffhanger, one that was hopeful. With the topics discussed in the the novel, I think it all softly comes to a close, bringing everything together. I finished the novel feeling quite bitter sweet with it, yet overall all satisfied and happy. I have to admit despite it being aimed at a younger audience, I really gravitated to this book, it brought a fresh youthful light, compared to the usual books I read and reminded me of the girly/fun novels I used to adore when I was slightly younger. I'd definitely recommend it if you'd like something a bit fresh, heart warming and hopeful - a fabulous book written by Zoe! I hope you enjoyed this book review. Have you read this and what did you think? I can't wait to read the first book because these seems amazing! I'm so excited to get this book, it sounds so good! I read the first book and I loved it , but I haven't read this one yet because it isn't where I live yet but when it comes out here I'll definitely buy it because it looks like a really great book . I really liked this review!